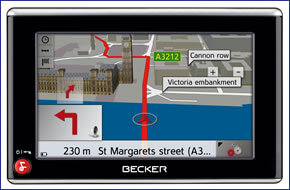 Becker Traffic Assist Z102 is pre-loaded with 42 European countries via a 4.3-inch TFT touch-screen display. The Becker Traffic Assist Z102 features TMC antenna for live traffic information, 3D Terrain View and 3D Town View allowing you to prepare for on-coming driving demands. During navigation, the announcement of street names is also integrated into spoken navigation instructions. Becker Traffic Assist Z102 unique 'Lane Assistant' indicates the recommended driving lane in advance and 'Reality View' provides true to life motorway junctions making it easier to find your way. Becker Traffic Assist Z 102 has been discontinued. Accessories, spares and parts are still available for your Traffic Assist Z 102. Becker Traffic Assist Z102 is a new-generation personal navigation device and features a 4.3-inch TFT touch-screen LCD with full 8-digit UK postcode search. The Becker Traffic Assist Z102 2D and 3D maps views displays have been enhanced to include turn-by-turn displays that can be individually selected according to the situation. Becker Traffic Assist Z102 is preloaded with maps of Western Europe and Eastern Europe, in total the Becker Traffic Assist Z102 provides street-level mapping for 42 European countries (a full list of available countries is listed below) in 22 different languages. The Becker Traffic Assist Z102 also features TMC (Traffic Message Channel) module for advanced warning of traffic problems in the road ahead. The Becker Traffic Assist Z102 advanced features include 'Lane Assistant' which alerts the driver to a lane change ahead of time. The Becker Traffic Assist Z102 is equipped with Reality View: nearly 4,000 directional signs on European motorways are presented true to life on the high-resolution display to make it easier to find your way. The Becker Traffic Assist Z102 route calculation can be selected according to profiles, which include: normal car, fast car, slow car, truck, motorcycle, bicycle and pedestrian. Once selected these profiles will generate a route specific to your chosen method of transport. Ideal also if you intend to use your Becker Traffic Assist Z102 for walking or cycling. The Becker Traffic Assist Z102 includes route information including arrival time, destination address, intermediate destination address and travel time remaining. Route selection provides options for fast route, short route, best route and scenic route. Advanced route options include with/without motorways, with/without toll roads and with/without ferries. Nearly 4,000 directional signs on European motorways are presented true to life on the high-resolution display. This provides a clear overview and alerts the driver ahead of time to upcoming lane changes motorway junctions. The Lane Info function points the way on multi-lane roads and complicated motorway exits. This gives the driver enough time to change lanes as required. 3D Terrain View - During your journey, the landscape you are driving through will be displayed in 3D. This provides prior notice of approaching ascents and descents or winding roads, allowing you to prepare for on-coming driving demands. 3D Town View - While driving through towns and cities, buildings and streets of houses are represented in 3D along your route, showing you in Map View the scenery you are currently driving past. This presentation of buildings along the route makes orientation easier in urban settings. The Becker Traffic Assist Z102 map data for Europe contains special destination points of interests (POI) including airports, hospitals, service stations, hotels, restaurants and stadiums. Miniature icons show points of interest along the selected route. 3-D landmarks enhance spatial orientation on the road. Buildings and other characteristic landmarks along the route are shown in three-dimensional views. Becker Traffic Assist Z102 provides real-time traffic information via the TMC (Traffic Message Channel) Module and then displays the various events and give you options on how to avoid traffic congestion in the road ahead. This feature is also available when Becker navigation guidance is inactive. The Traffic Message Channel is available for the Becker Traffic Assist Z102 TMC system in the following European countries: Austria, Belgium, Denmark, France (free TMC only), Germany, Italy, the Netherlands, Spain, Sweden and Switzerland. In addition to navigation the Becker Traffic Assist Z102 features integrated MP3 player, JPEG picture viewer and video player. Listen to music via the integrated MP3 player and two internal speakers or headphones without interrupting navigation. The display shows ID3 tags (title, artist), elapsed track time and directories. The Becker Traffic Assist Z102 also features a video player for playing videos. The Picture Viewer feature presents JPEG images separately or in a slide show on the brilliant low-reflection, high contrast 4.8-inch touch-screen display with 16-bit density and 65,536 colours. The Becker Traffic Assist Z102 features country specific announcements, including a choice of 22 languages: (BR, CA, CZ, D, DK, E, F, FIN, GB, HU, I, MX, N, NL, P, PL, RU, S, TR, US, Vlaams). The Becker Traffic Assist Z102 personal navigation device has been designed for plug and play, and as such can be transferred from vehicle to vehicle with ease by the user. The Becker Traffic Assist Z102 is powered with a 12-24 volt adaptor cable in-vehicle (supplied) and using the Becker Traffic Assist Z102 mounting bracket can be used to secure the Becker Traffic Assist Z102 directly to the windscreen or dashboard. The Becker Traffic Assist Z102 utilises NAVTEQ maps for street-level mapping across 42 European countries. The Becker Traffic Assist Z102 maps are pre-installed on the internal 2GB internal flash memory and includes the following countries: Albania, Andorra, Austria, Belarus, Belgium, Bosnia and Herzegovina, Bulgaria, Croatia, Czech Republic, Denmark, Estonia, Finland, France, Germany, Great Britain, Greece, Hungary, Ireland, Italy, Latvia, Liechtenstein, Lithuania, Luxembourg, Macedonia, Moldavia, Monaco, Netherlands, Norway, Poland, Portugal, Romania, Russia, San Marino, Serbia and Montenegro, Slovakia, Slovenia, Spain, Sweden, Switzerland, Turkey, Ukraine, Vatican City. The Becker Traffic Assist Z102 provides dynamic route guidance with TMC in Austria, Belgium, Denmark, France (free TMC only), Germany, Italy, the Netherlands, Spain, Sweden and Switzerland. TMC information can be accessed when route guidance is deactivated. Looking for accessories to use with the Becker Traffic Assist Z 102 sat nav? We sell a vast selection of genuine parts and spares including Traffic Assist Z 102 travel case, car charger, mini USB mains charger and external GPS antenna.